This find, with nearly every helmet being a camo version, throws cold water on those who say that there are too many camo helmets and that most are postwar paint jobs. It also lends credence to the theory that the retreating army had little time for photography. Those who say that there is no photographic evidence that camo helmets were common, have not seen this. Hey Chip. The Germans may not have taken photos of the camo helmets, but the Australians did, there is a series of photos of German POWs captured on 8. August 1918. 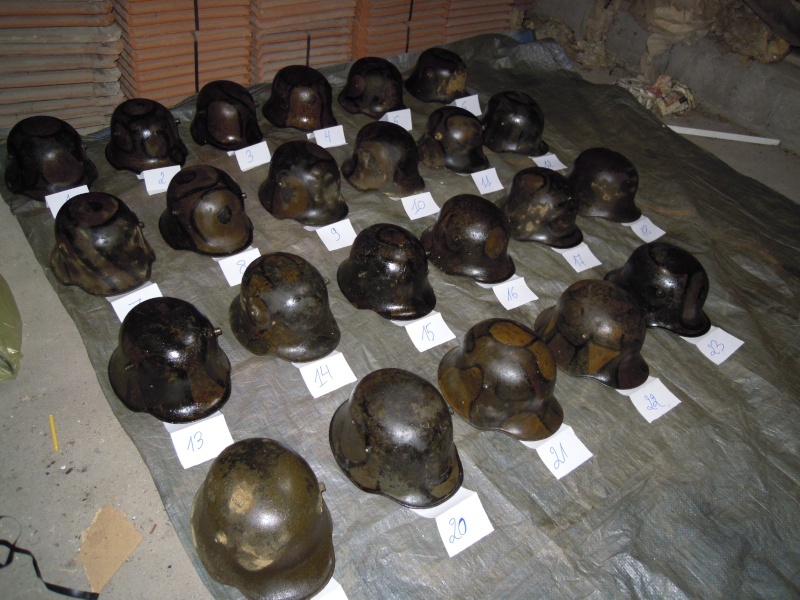 Many of the helmets visible are camo, the most common being the black boarder version. I wish there WERE spots in NZ for relic hunting!! What Battlefield area were they found in ? I don't even know what to say! there so preserved! what are the prices? Please ask the question by pm to "harvest".Thanks.He is the owner of these helmets. wow .... amazing how some of those lids survived !!! how much for one of the helmets? They are in an amazing state of preservation! this is truely one of the coolest things I have seen in a while. I am part of a Relic hunting group here in Germany and we have not had the fortune to find such awesome things! with your permission I would like to share the pics. Really awesome! yes share some pics no problem !! !